It’s that time of year when the days are short, but the months feel long. Especially after we pass the January holidays! So, winter resources that you can switch out to shake things up a bit can be essential. Read on for some language and independent resources that will help you stay out of the winter doldrums. We all know how much I love interactive books. I love them for lots of reason including keeping students engaged, giving students success in reading, and helping build seasonal vocabulary. And we can get some literacy and communication goals in there too! There are 5 interactive books, just like with all my seasonal interactive books. And each book has a word and a picture on every page (except when answering questions). Two of the books have questions at the end for students to answer yes/no. This illustrated book focuses on cold and warm climates during winter by talking about clothing of 2 children and comparing and contrasting the clothes they wear (e.g., Dustin wears a coat. Sarah wears a t-shirt.). At the end of the book, there is a choice board with visuals that the students can use to answer if they live in a warm or cold climate. This illustrated book focuses on the sports that take place primarily in winter indoors and outdoors. This illustrated book concentrates on the clothes we wear when the weather is cold by helping Sam get dressed. This illustrated book focuses on the process of making instant hot chocolate. It includes a mix of nouns and verbs and includes visuals to support a yes/no question at the end for whether the students like hot chocolate. This illustrated book targets verbs and depicts common activities that people do in the winter (mostly in snow). I love to use interactive books for morning meeting. 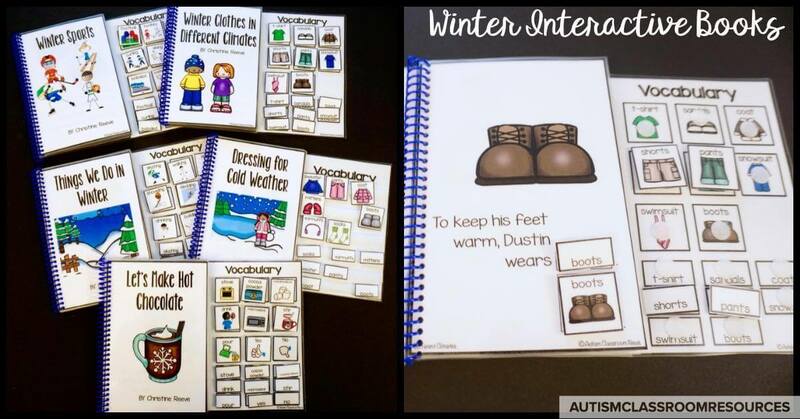 With the winter resources books you can also tie them in to your weather activities in the group. You can practice the vocabulary and test out what it means. Try giving each student a picture or word depending on their reading level (they could choose from a choice board). Then, when that item appears on the page, work on raising their hand and practice the vocabulary at the level that makes sense for them. The students put the picture and/or word on the page. And then they could read the sentence, or say the name of the picture, or read just the word. Or they could point while you read it to the class. 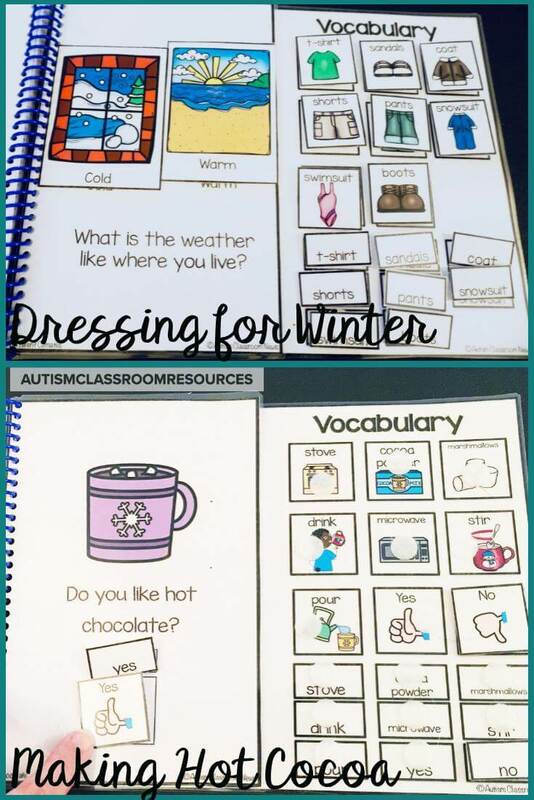 Obviously the books are great for building vocabulary, but you can also use Let’s Make Hot Chocolate and Dressing for Winter to work on sequencing skills. The students can read the book and then put the pictures in order of the story. You could then have them tell you the story from the pictures. You can also work on comparing and contrasting using the Winter Clothes for Different Climates. Students could sort the clothes by different temperatures or climates. They could also answer questions like, “Would you wear a sweater when it’s warm or hot?” and use the visuals from the end of the book to help them answer (either as nonverbal prompts or by choosing the right picture). Once students are familiar with the books and can match the pictures and / or words, I like to put them in the independent work system. This way the students continue to practice reading. And I always like to give them reading things they can be successful with so that they keep up their confidence. Remember that you can choose to use just the words (leave the pictures in the book) or just the pictures (leave the words in the book) depending on the skills your students have. Check out the preview video to see all the vocabulary and pictures included in the books. Next up are the generalization materials for working on identifying colors. These go well with my colors discrete trials materials. They are meant to be an extension so that students learn to use colors in a variety of different ways and with different materials (hence generalization). However, even if you aren’t teaching colors in discrete trials, this is a great varied bundle of activities that are perfect for small group and independent work. --4 Interactive Books (an illustrated book with colors of snowmen, a photo book of the colors of different climates at winter, an illustrated book of colors of winter clothing, and a photo book of colors we see in winter). --2 Mini Coloring Books (print and go) that students cut and paste and color the items the identified color. There are 2 versions of each mini-book—one with picture and color cues for the directions and one without (for students who could read it or for staff to use for receptive ID of colors). --Match to a Winter Colors Book of colors. 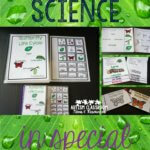 The book can be assembled as a book, pages on a cookie sheet, or in a file folder or file folders. There are 1 set of photos and 1 set of clip art to sort and match to color pages. Color pages come in full color and color outlines, for saving ink. --5 Matching File Folders (color block to photo, mittens, hats to penguins, storing ice skates, and buttons to gingerbread). The gingerbread file folder can also be matching gingerbread to gingerbread. The interactive books are great for use in morning meeting for simpler or more consistent (rather than seasonal) vocabulary. In other words, you could use all 4 seasons of color books and they are still working on the same 9 color words, but with different pictures. I use them similarly to the winter resources interactive books I described above. BUT, you can also do it in a simpler way. You could read the book and find the colors (or have one student or group of students match the colors to the pages). Then for a student who isn’t quite ready to match colors to pictures, he or she (or they) could put the pictures back on the storage page when it’s finished. Obviously the interactive books can go in independent work, just as the seasonal ones do. Remembering of course that you could have the students match to the back page for a simpler task. The mini-coloring books are great for small group or independent work if the students have mastered all the colors. If they have only mastered some, you could just give them those pages. Unless the students are readers, I would use the ones with the visual cues for this. The find and color sheets are also great for independent work if the student can receptively identify any of the 9 colors. They are easy to just give 1 or 2 of the mastered color sheets to complete. Just laminate them and have them circle the correct answers with dry erase markers. Then you can check them, erase them, and they are ready for the next system. The Match to Winter Colors books are PERFECT for independent work. You can make the color sheets into a book, put them on a cookie sheet with magnets or just give them 1 or 2 sheets with Velcro on them. What I love about them is that they are so easy to differentiate. 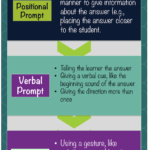 Have a student who needs an errorless task in independent work? Give him 1 page and the matching color pieces. Then he just has to put the pieces on that one page (no color discrimination necessary). Have a student who only knows 2 of the colors? Give him 2 sheets and just those colored pieces. Then he can practice matching just the ones he knows in independent work! Finally, the file folders are obviously great for independent work if the students have mastered all 9 colors. If they haven’t, then they might be useful for Table Tasks or small group instruction. Want to see more? Check out the video preview. Ever struggled with how to get students engaged in small group instruction when they are just starting out. We know that our students are so much more successful when they are engaged in activities, but many of them need some 1-1 attention. And many of our classrooms don’t have the staff for that. All the materials in this set are great for students to work with limited supervision while you are working with another student on new material. These types of activities have always been my go-to for having students practice concepts they are still learning and freeing me up to teach another student while they do it. Then I can switch. Our students with language delays and disorders obviously need to expand their vocabulary. But more than knowing what an item is or naming it, they need to be able to talk about it and understand when others talk about it. That’s why being able to identify items by characteristics, by function or purpose and by category or class is so important. It’s not enough to find my shoes when you tell me shoe. I need to be able to get my blue shoes instead of my red shoes if that’s what you tell me to do. This set doesn’t get to those multiple elements (e.g., blue and shoes), but it does set the foundation for understanding that items can be described by different characteristics. And it builds the student’s ability to understand directions and eventually to talk about the item. For instance, if I say, “Get me something I can write with” they know they can get a pen or a pencil but not a shoe. This set has a combination of worksheets for identifying items by category, ones where the student colors items of a specific category or a certain function. There are also 2 sets of sorting mats (one with a model of an item of a the category and one without. I love that there are so many that you can just print off and use without laminating or cutting. And then there are some that can become staples of the classroom. These materials were made specifically to have students practice their skills while I am in a small group working with another student. Working with a group of 2 or 3, I can be working on a new concept with 1 student, while another is doing a file folder and the third is working on one of the worksheets. 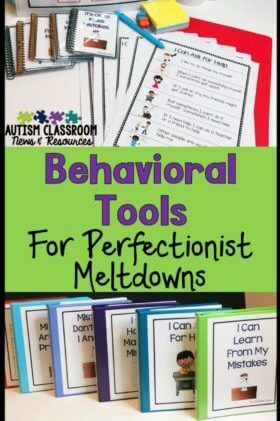 Like the color activities, these materials were designed for generalizing skills that often have to be taught explicitly to some of our students. Because of that, they are perfect for independent work systems once the students have mastered the concepts. With Velcro on the sorting mats and file folder, all the tasks meet the criteria for a good task for an independent work system. I like that there is variety of materials so they don’t get bored. For instance, they could complete a different color-by-category worksheet each day for a week. The same for the other coloring worksheets. And they could do a different bingo marker sheet each day for 2 weeks. This makes it easy to mix things up and keep them from memorizing work. Oh, and all of these items are cross-listed with a variety of early childhood curricula like the ABLLS, PEAK, VB-Mapp and the STAR so you can see how they fit in with those teaching programs. *this product is not affiliated with any of these curricula however. These matching tasks are designed specifically for independent work. They focus on early common core concepts of letter matching and identification and number identification, counting and sequencing. They are all designed to be laminated and assembled and then will last for years. All the thematic concepts are about winter from snow to hot cocoa. 5 file folder activities that address lowercase and uppercase matching, sequencing, and matching initial letters to pictures. And 60 task cards that work on number concepts. These activities are great staples for early childhood center rotations in preschool and in kindergarten. They provide good practice on using letters and numbers in different ways. They also have a wide variety of skills so different students will need them. I also really like them to supplement early childhood activities for our students in special education when they are participating with the typical peers. Because they have manipulatives and are visual they sometimes are good supplements in early childhood to help our student access the curriculum. 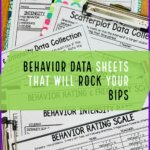 These activities were designed specifically for independent work systems and actually make up my independent work bundle for early learners. As with all my tasks, they have all the characteristics of good independent work tasks, meaning they have clear endings, they can stay together (with Velcro on the file folders), and they are visually engaging and easily manipulated. I like to cycle these in and out of systems with my other seasonal early childhood tasks. That way the students are working on the same concepts without getting bored with the materials. Finally, these worksheets are a bit different than the other areas in that they are more general ed. focused. However, they have differentiation built in specifically so that students who have difficulty with vowel sounds have access to different versions that are accessible to them. I love them because I can print them and the students cut and paste, so there is no prep other than printing. There are 3 versions of each sheet. One without cues, one with word cues and one with picture cues. Whether in general education or special education, these are great to have students practice in early elementary classrooms. I like to use them with kindergarten general education classrooms and it’s easy to differentiate for the students who need the extra picture cues while the other students might complete the ones without cues. These also make great independent work tasks, and are easy to pull out at the last minute if you have extra copies. Students cut and paste the snow balls and sort by long or short vowels. When all the snowballs are gone, the task is completed and can be put in the finished basket. 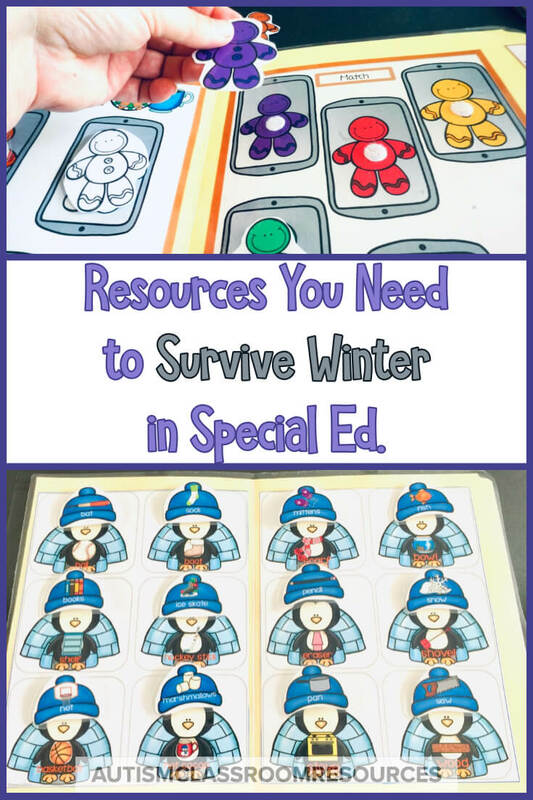 So there are lots of ways you can use these winter resources, but there is almost something for everyone. You can check out each one by clicking on a picture. And if you have questions, let me know.